A group of activists who try to save the rainforest in Peru realizes that there are things deep in the woods that shouldn’t be discovered. 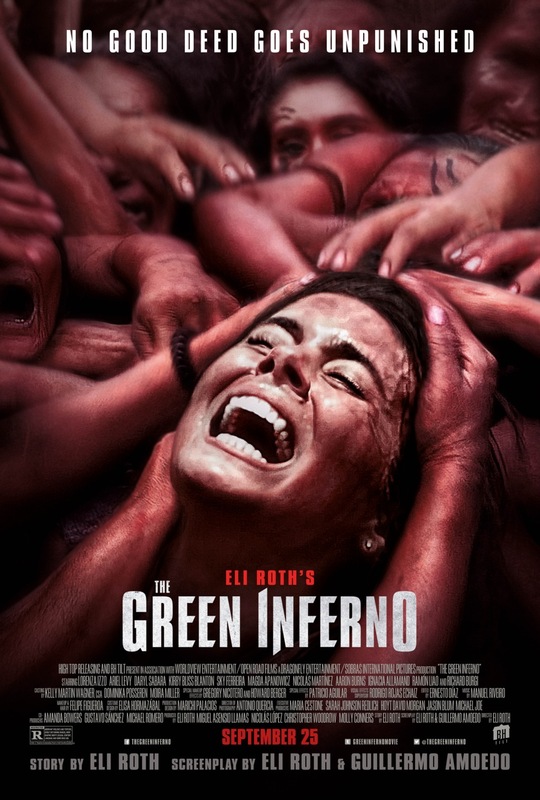 The Green Inferno the second Eli Roth movie I have seen in a short time period; after Knock Knock has been quite the disappointment I was not expecting too much of The Green Inferno. The things that people complain about the most when it comes to Eli Roth movies is the slow beginning. I actually like when a movie starts this way, slowly building up the plot, introducing the characters and then suddenly the mood changes to an edge of the seat feeling. That’s something I really appreciate about Mr. Roth’s style. I did expect to see violence and gore but this was honestly too much for me. Without giving too much away you have to know that The Green Inferno is inspired by the infamous movie Cannibal Holocaust (1980) that seemed so shockingly real that people claimed its director Ruggero Deodato actually killed the actors to make it more realistic and disturbing. I have never watched the movie because I don’t care for cannibal movies. But Eli Roth appears to be obsessed with it since the movie has many parallels to Cannibal Holocaust. I can understand that some of the Inferno audience had to leave the theater because the torture and actions were beyond gruesome. So if that was Roth’s goal he clearly succeeded. The funny thing about this movie is that the tribe that captures the students in the movie was a real tribe from the amazon. Eli Roth and his crew approached them and asked if they want to be a part of a movie. They didn’t know what a movie was, so they showed them Cannibal Holocaust and they found it hilarious, they actually thought it was a comedy, so they thought The Green Inferno was going to be one as well. All in all I like the authentic setting, and I didn’t mind the slow beginning. But the gore and violence part was overwhelming at times and some parts could have been left for the viewers’ imagination. I was not a fan of the non existing character development and ending either. Would I watch it again? Probably not. Would I watch a sequel? I am afraid so, just out of curiosity. I think ELi Roth and gore fans will enjoy this movie. My two favorite Eli Roth movies remain Hostel and Hostel 2. BEWARE: EXTREMELY VIOLENT AND DISTURBING. I was not a fan but I know it will have its fan base for sure. I really didn’t like Hostel so I think this probably isn’t for me but that bit of trivia is hilarious! Hahahaha glad you liked it. Yeah I would say stay away from it.